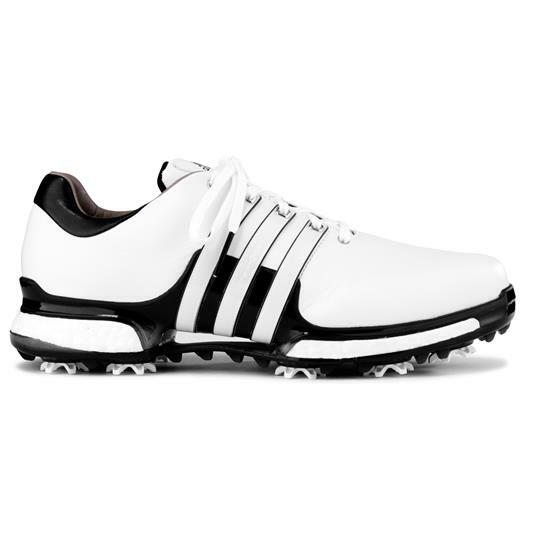 Support feet and keep them dry with Tour 360 Boost 2.0 Adidas Golf Shoes. These wide men’s golf shoes have a rounded toe for a natural feel while the arch support, ten cleats, and Boost cushioning support the foot. For maximum durability, the uppers are made from leather and use Climaproof to keep feet dry in wet conditions for at least two years. To support the ankle and make taking the shoes on and off easier, the collar is also made from durable leather. 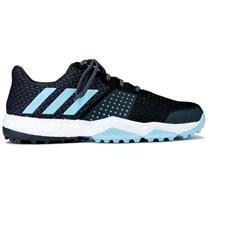 To keep feet feeling energized through a long day on the course, Adidas created Boost, their most responsive cushioning that returns energy with every step. Feet will also stay comfortable from the synthetic interior lining that promotes a comfortable foot climate and reduces friction. For a superior fit, the Fitfoam SlowRecovery PU conforms to your feet. For increased stability, multiple stability enhancing features went to the design of the shoe to support your feet and stance. It starts with a dual-density Puremotion TPU outsole with a high TPU plate as the base of stability. The soles’ Thintech design offers a lower profile to lower players’ center of gravity to boost stability and power. To provide you with stable footing on uneven terrain and through powerful swings, ten cleats are outfitted on the sole. Superior support is also offered with the use of a 360Wrap that keeps your feet locked into place. To support natural bend and flex of feet through swings, the forefoot and heel are able to flex independently of each other. This advancement also offers better arch support.